Working at a startup, you tend to get very philosophical about what you are trying to accomplish, how you are doing it, and why it is important. On a typical tech team you have a business person, a developer person, and a design person. How they interact and push and pull is the magic that creates a viable, functional, and beautiful product. But these areas overlap in ways that are not entirely clear. The designer likes to create shiny design prototypes that get people salivating. The developer likes to focus on the data model and information architecture. The business person is focused on usability and marketing. Which is most important? Which do you tackle first? It behooves every team member to understand with crystal clear clarity what their role is and how it relates to the whole. Here is my approach: at the core of any app is the data. Just information. Text, files, databases, videos, music, photos, etc. It is abstract; it has no form. Like the guy on NPR said, it “just sits there.” UX is the way that your app manipulates data that makes it useful to a human and gives it meaning and value. UI is the concrete mechanism by which the human manipulates the data, which gives the human satisfaction and delight. Let’s run with the story analogy. A story is a narrative designed to interest, amuse, or instruct the consumer. It can be read in a book, told to a child, watched in a movie, or heard in a song. One could argue that the medium is equivalent to UI, and the plot equivalent to UX, and the moral equivalent to data. 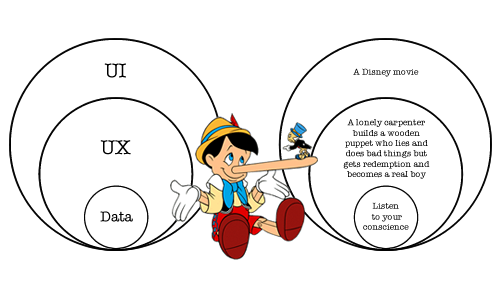 Let’s use Pinocchio for example. The moral of the story is “listen to your conscience.” This is the data. But humans respond better when things are shown to us, not told to us. So at some point somebody constructed a story about a lonely carpenter who builds a wooden puppet who lies and does bad things but gets redemption and becomes a real boy. This is the UX. Throughout history, this story has been presented in countless ways: in books, short stories, plays, and even a Disney movie. This is the UI. Steve Jobs once said Apple was proud to be at the intersection of technology and liberal arts. Good things come when companies don’t lose sight of the humanity driving and consuming what they do. Use the power of stories to better understand your own development process and create products that are equally viable, valuable, and delightful. Love the diagram – did you make that? brilliant analogies, martin. at the end of the day, when you start a company, build a company, build a product, provide a service, and are lucky enough to have a customer engage with your product or your service, the story is really all that matters. Each interaction with your app is its own little story, and the larger relationship a user has with an app, the more connected she is to the main story you’re trying to tell… so if you get your stories well told, and well presented, and make them compelling, then you have that most valuable of all things in business: a true and unique connection to your user. and when you have that, you have a very valuable product and business.